See The Books of Enormous Size! One thing I thoroughly enjoy is rather long books. Books that take months to finish and leave you breathless. I’ve compiled a list of long books, with a short summary and the length of the books. Enjoy! Doesn’t really need an introduction, pretty much everyone knows about it. The Bible has about 1100 pages to it. In ancient times, rings called The Rings of Power were crafted by Elven smiths. A ring was crafted called One Ring, and it was a ring of supreme power. When the One Ring falls into the hand of an innocent hobbit, he realizes that he must destroy the ring. He sets out on a rich and exciting adventure to destroy the ring. All three books together have a combined total of 1008 pages. Harry Potter – J.K. Rowling . A young boy with an unusual scar goes to a special school for wizards, where he finds out the history to his past, and has to face it, literally. There is a total of 3407 pages within all of the Harry Potter Books. When a terrible super flu lays waste to the world, it is discovered that supernatural forces might have a playing hand in the cause of it. Throughout this heavy hitter resides a constant battle between the forces of good and the depth of evil. 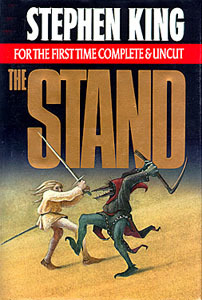 The total pages of The Stand is 1168. Any other long books y’all would like to add to this list? Feel free to comment below! A Suitable Boy by Vikram Seth: 1474 pages. It’s currently sitting on my bookshelf, waiting to be read. I’m actually a little scared of it, lol. But I do love thick books. My friend has read Clarissa (1534 pages). All he replied was “never again”. The Redemption of Althalus by David Eddings has 928 pages, I read it in about three days, I lost about half a stone in wieght and don’t regret a minute of it.